Note - Messenger campaigns and integrations are only available on our Full-Time Seller and Large Business plans. Instead of email capture, you can create a landing page that distributes single-use promo codes in a Facebook Messenger conversation. Once the customer clicks your CTA button, a conversation will be opened and a chatbot sequence triggered. You will also be able to configure two follow-up sequences through Messenger, as well as enabling lead capture with a ManyChat integration. To create a Send-to-Messenger landing page, click "New Campaign" and select "Messenger Landing Page". Next, enter your Amazon product URL as normal. Click “New Campaign” once the import is complete. You will be prompted to sign in to your Facebook account. This should be a Facebook account that is able to post from your business’ Facebook page. Enter your promo details, such as regular price, discounted price/discount %, and campaign run times. Finally, select the Facebook page you want to post from. This will be the page that your customer interacts with inside of Messenger. Next, customize your landing page design as normal. We suggest adding an attention-grabbing title and optimizing your page copy for readability and engagement. The next step is to set up your bot sequences and integrations. There are three chatbot sequences you can set up. This is intended to send a reminder to your customer about their coupon code, as people on Facebook are not always ready to buy then and there, and therefore may claim a coupon but forget to use it. You can choose how many hours following the original claim to trigger this sequence, however it should be within less than 24 hours, to comply with Facebook’s Messenger chatbot policies. This sequence is to follow up on your customer’s purchase and ask for a review. It can be triggered a number of days after the original claim. You should allow enough time for your customer to receive their product and test it out before asking for a review. The wording can be customized in a Yes/No flow, but be sure to protect yourself by following Amazon’s Terms of Service. Ask for honest reviews (not only positive reviews), and don’t offer incentives for someone to post a review. Next, you can integrate your ManyChat account with your LandingCube campaign. Note: ManyChat API integration requires a pro ManyChat account. 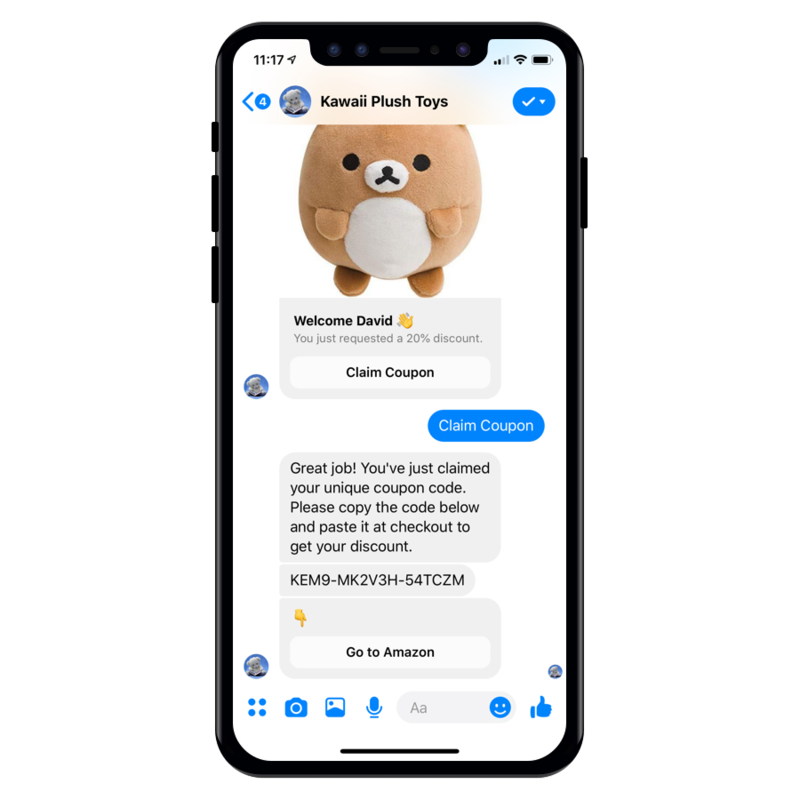 Your chatbot sequences will still operate without a ManyChat integration, and your Messenger campaigns will show up in ManyChat. However, you will be unable to automatically tag subscribers through LandingCube. To connect your ManyChat account, log in to ManyChat, click “Settings” then “API” to get your API token. Paste the token in the field provided. A blue checkmark will indicate your account has been connected successfully. You may wish to add a tag to your subscribers. After setting up your tag in ManyChat, it will be available to choose from by clicking on the “Tag” field. You can tag either successful coupon claims or unsuccessful claims (most likely caused by running out of coupons or your campaign reaching the daily coupon limit). Finally, ad extra features to your page such as Facebook Pixel tracking, Google Analytics and a Redirect URL (such as a Super URL or 2-Step URL to help you rank for keywords). The last step is to upload your single-use promo codes, set a daily code limit (optional), and customize the slug of your landing page's URL. Click "Save" and your landing page is complete.